Whether you get to your college dorm room by train, plane, or car, you should have a kit to make packing your toiletries as easy as possible. 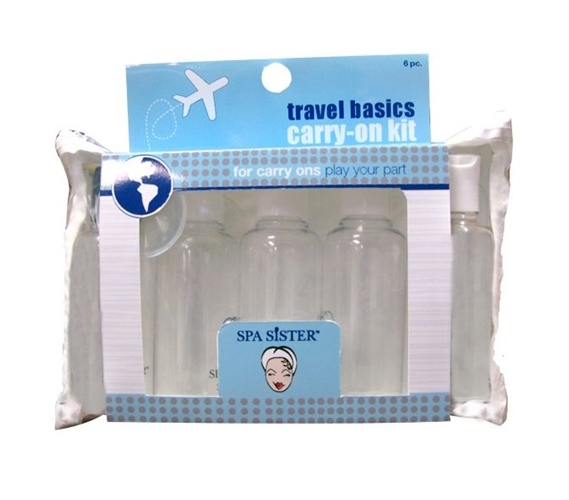 Our 6 Piece Basic Carry On Travel Kit is made to make college dorm room to home travel as easy and simple as possible. No college student wants to come home on winter break and realize that his or her contact solution was left behind in the college dorm room! Avoid toiletry troubles with our dorm room travel 6 Piece set. Our set includes a shampoo bottle, conditioner bottle, shower gel bottle, body lotion bottle, and hair product bottle funnel. The best part about all of the supplies in our dorm travel kit is that they come in a ready-to-go cosmetic bag. With our 6 Piece Basic Carry On Travel Kit in your college supplies you'll be able to pack up all of your toiletries quickly and easily without forgetting anything. Our kit is especially important for students who fly back and forth between their college dorm room and home. All of the supplies in our travel kit are made to fit the regulation sizes required for airline travel. Whether you're an hour or ten ours from your college dorm room, you need to add our 6 Piece Basic Carry On Travel Kit to your college supplies in order to truly travel worry free.